There is also broad optimism about the performance of China’s athletes among the Chinese public. 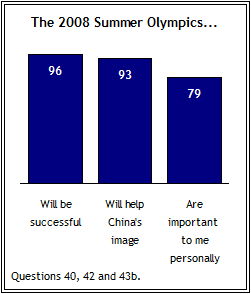 Yet, despite the widespread excitement about the Olympics, some in China say their country is paying too much attention to the games, and the percentage who expresses that opinion has increased since Pew last asked the question in 2006. The Chinese have confidence that their country’s athletes will perform well in August. Three-quarters say China, which finished third, behind the United States and Russia, at the 2004 Summer Olympics in Athens, will win the most medals. 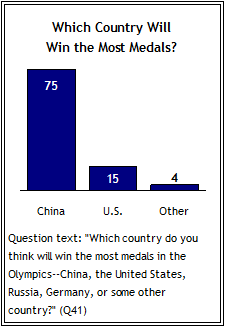 Only 15% think the U.S. will take home the most medals. 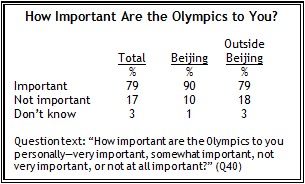 Overall, more Chinese respondents say people in China are paying the right amount of attention to the Olympics than say they are paying too much or too little attention. 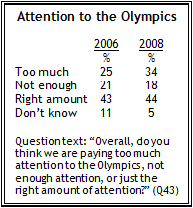 But the percentage saying they are paying too much attention has increased since 2006. More than one-in-three Chinese (34%) now say that people in China are paying too much attention to the Olympics; just one-in-four shared that view two years ago. 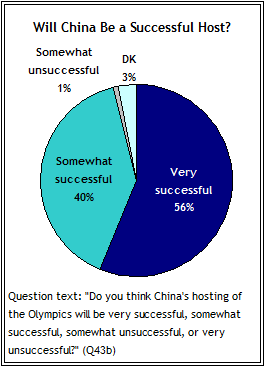 About one-in-five (18%) say the Chinese are not paying enough attention to the Summer Games. The opinion that there is too much focus on the Olympics is more prevalent in the host city than in other parts of the country. Beijing residents are nearly evenly split – 46% say people are paying too much attention to the Olympics and 51% say they are paying the right amount of attention. Only 2% in Beijing say that not enough attention is being paid. Outside of Beijing, however, 33% say people are paying too much attention, 19% say they are paying too little attention, and 43% say they are paying the right amount of attention to the games.